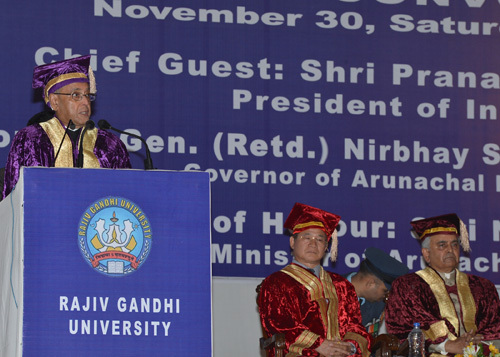 I am happy to be here today for the Twelfth Convocation of the Rajiv Gandhi University, a premier institution of higher learning in Arunachal Pradesh. I am also glad to make use of this opportunity to visit this beautiful state in the eastern most region of our country. This state is considered the ‘nature’s treasure trove’. The physical beauty bestowed by nature is only matched by the splendor of the songs, dances and crafts of the people. Arunachal is a historical land. Its name finds mention in the literature of Kalika Purana and Mahabharata. This land is marked by important centres of pilgrimage like Tawang Monastery and Parasuramkund. Arunachal Pradesh is on the threshold of a major transformation. Economic sectors, especially hydro-electric power and tourism, have immense potential to drive the development of this state. Education has to be a facilitator to this change. Rajiv Gandhi University, established in 1984, has imparted education to several thousands of youth in this part of the country. It has created necessary infrastructural and intellectual resources for quality higher education. The courses and extension programmes of the University have catered to the socio-cultural, economic, ethnic and geographical requirement of the region. Through its affiliated colleges and post-graduate departments, the University has made a visible impact in teaching-learning innovations and quality research. I compliment the Vice-Chancellor and the entire academic and administrative team of this University for these achievements. I congratulate all of you on whom this University has conferred degrees today. Convocation is an important event in the academic calendar of any university. It gives a sense of identity to the graduating students. It is a day to acknowledge your success achieved through perseverance and dedication. It is also a momentous day for your family and friends who have stood with you through thick and thin. Convocation day reaffirms the solemn duty of each generation to transmit the best of its knowledge, culture and wisdom, gathered in the hallowed precinct of the university, onto the next generation. It reminds of the responsibility that awaits you as graduates and scholars. Dr. S. Radhakrishnan had said and I quote: "The aim of education is not the acquisition of information, although important, or acquisition of technical skills, though essential in modern society, but the development of that bent of mind, that attitude of reason, that spirit of democracy, which will make us responsible citizens” (unquote). There are many who do not even get an occasion to enter the portals of colleges or universities in this country. The society, which has invested in your education, can legitimately expect a dividend from you. You can pay this dividend by helping your less fortunate brethren. You can shape the destiny of our nation by your drive, initiative and ingenuity. Education is the bedrock of an enlightened society. It is the cornerstone on which a progressive, democratic society is built - where rule of law prevails, where there is respect for the rights of others. A good education breeds tolerance for divergent views. It prods us to use our learning for the good of mankind. Our country has done well in terms of economic development. Yet, we cannot claim to have evolved into a truly developed society. Development is not only about factories, dams and roads. Development, to my mind, is about people, their values and their devotion to spiritual and cultural heritage of our nation. At a time when we, as a nation, have to make an extra effort to surmount the contemporary moral challenges, it is holistic education that must play a definitive role in shaping our values. Our educational institutions have a pivotal role to inculcate in our youth the core civilizational values of love for motherland; performance of duty; compassion for all; tolerance for pluralism; respect for women; honesty in life; self-restraint in conduct, responsibility in action and discipline. Indian civilization has a long standing knowledge tradition. Our ancient universities - Takshashila, Nalanda, Vikramashila, Valabhi, Somapura and Odantapuri – were renowned seats of learning that attracted scholars from outside. Today, our universities lag behind the best universities in the world. According to an international survey, an Indian university or an institution is missing from the top two hundred ranks. We cannot afford to continue with an education system which is even a notch below the global standards. India is poised to become a world power. Our leadership in fields such as science and technology is incumbent on the level of competence in our scientists, academics, engineers and doctors. We have to therefore salvage the declining standards of our country’s higher education on top priority. Shortage of teachers must be addressed on priority. Top quality teachers must be drafted. Teaching as a profession must be made attractive for bright students. Innovative teaching methodologies must be adopted by increasing the use of technology. A culture of excellence must be promoted. Every university must identify one or two departments that define its core competency and nurture them into centres of excellence. Research plays a crucial role in extending the knowledge frontier of the society. It gives rise to new thinking. It results in new and perhaps better direction to solve numerous problems faced by the society. The quality of research in Indian universities leaves much to be desired. Research facilities must be upgraded to international standards to attract the brightest minds. The research temper of the students must be developed. The spirit of innovation must be ignited in the young minds. Universities must become an important platform for any researcher to pursue their curiosity and creativity. This University must prioritize the fields of research that it wishes to undertake. There is scope for conducting innovative research in North East India, a region rich in natural resources and biodiversity. Over-exploitation of natural resources causes environmental degradation and leads to long run unsustainability. The onus is on you to work out alternative growth models, which are sustainable. You must carry out inter-disciplinary research on natural resource management. You must conduct research on challenges to hill economy, conflict between traditional and modern institutions, border trade opportunities and integration of the North East economy with the national and global economies. It is gratifying to note that a few departments of Rajiv Gandhi University have received grants for setting up research facilities. I expect the university to conduct relevant research to the benefit of this region and the country. Getting a degree, which you all richly deserve, is only the beginning. After completing university education, you have a higher calling to tend to - the task of nation building which, without each one of you collaborating, will remain under-performed. Go out with the knowledge that you have the tools necessary to build our nation and take it to the future. Remember that once you step out of your alma mater, life will provide you ample opportunity to learn. Gain knowledge from wherever you get. Be humble. Be free from fear. Be generous. In whatever field you are working, always try to enhance the prestige of your university and country. If you have skill power and will power, you can make it happen. I wish you all success in life. I also wish the management and faculty of this University the very best.